The tech world is buzzing about the new Firefox, version 3.5, and its seemingly flawless launch today, allowing up to 2 million downloads in less than a full business day. But like a lot of other extensions, the popular printing-related add-ons are a mixed bag in terms of being ready for the new version. A search at the Mozilla site shows the popular "Print Print Preview" not available, though runner-up "Universal Print" is ready to go -- an opportunity? 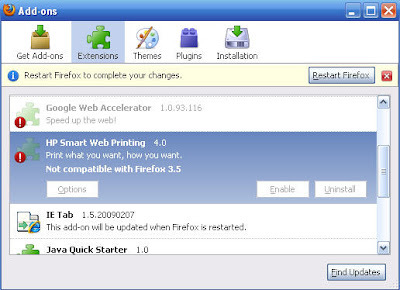 And the HP (NYSE HPQ) print-enhancement extension, Smart Web Printing 4.0, already installed in my Firefox plug-ins list, came up showing it's not compatible, though the issues that Smart Web Printing addressed became academic with the introduction of 3.0 (See further explanation in "HP's 'Reduce Printing' Tool for the Web", from a little over a year ago). 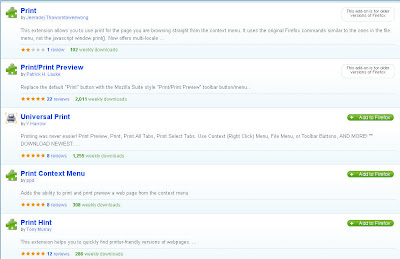 Not that these out-of-date (for now) extensions are in such bad company -- TechCrunch's MG Siegler (in "Firefox 3.5 Soars Past A Million Downloads. Approaching 100 Downloads A Second") notes that 3.5's perceived speed improvement (I've noticed too) may be attributable to all those missing extensions! I tweeted a couple weeks back about the new Memjet web site, which accompanies the Silverbrook Research site. I like this one too, showing where the Memjet components go in the printer -- and by deduction, what the OEM's responsibilities include, meaning that perhaps the time lapse from componet announcement to shipping printers is indicative of a pretty big order, and that we should not be too surprised that it's taking a couple of years. On that front, I will send readers over to Art Post's "Print For Pay Hotel" blog and his excellent post, "Who's Afraid of Memjet" and follow-up commentary from Memjet Home and Office Vice President Kim Beswick, on the current status of Memjet and its partners. And now take a look, not a comparison per se but the 4x6 proto demo, similar that got the buzz going in the first place, back in 2007. As covered here in May (see "Zink's Design Contest"), Zink is sponsoring a contest intended to let would-be printer designers "re-imagine printing and its role in the digital world". The 40 finalists spanning two categories have just been announced, and can be reviewed at the ZINK ZeroBoundaries Finalists web page. NEW! Now it is your turn to become a judge. ZINK Imaging has opened up judging to the public with a Peoples’ Choice Award. Voting is open now through July 13 at www.ZINKZeroBoundaries.com/vote. While the "peoples' choice" angle fits right in with popular culture's penchant these days for audience participation, there's also a related tie-in to crowdsourcing. John Winsor's recent BusinessWeek viewpoint, "Crowdsourcing: What It Means for Innovation", comes to mind as a source for a little more background on recent trends like outsourcing in fields such as industrial design. HP (NYSE HPQ) answered the weekend's second-most-mystifying tech world story (I'm granting the Steve Jobs secret-liver-transplant #1) with a Twitter-inspired press announcement in San Francisco Monday morning. Under the "hash code" of #hpreveal, buzz had been building over the end of the week and weekend (including in this blog -- see "Mystery HP Print Announcement - #HPReveal"), over what HP might offer up, with teases like "introducing a whole new platform" and collaboration with "some of the Valley's most renowned companies"
HP is bringing the power of the web directly to the printer and combining it with HP’s TouchSmart technology to give people quick, easy, touchscreen access to popular digital content. But IPG chief VJ, in tracing back the history of the original all-in-one (incorporating printing, scanning, faxing, and copying) creating a new printing category with first products in 1993, describes this new first-of-category model as the "ultimate AIO". Joshi's other effective historical reflection, positioned to see the future as well, as the HP printer business's first 25 years "riding the PC wave", and now looking ahead to see the Web as its driving force for content. In addition to HP, the announcement was strengthened by the presence of four of the announced HP partners in this new endeavor. Representatives of Coupons.com, Fandango, Google, and Nickelodeon talked about application development that's already occurred in their organizations, and all seemed very pleased that HP was committing to provide a superior printing solution for their coupons, movie tickets, maps, and kids' activity pages, respectively. With the Twitter action blazing during and after the morning event, it was easy to get at least bit of a handle on user and pundit reaction. Of those squeezing editorial content into their 140-character tweets, many seemed impressed and repeated the superlatives, e.g. "first-ever", while at least a few others saw little new in a web-connected printer that will continue to print Internet content that's currently being printed (profusely in some cases), sent down printers of all stripes via traditional browsers and web-connected PC's. The attempt to define a new web-connect printing platform is a bold move from the industry leader, and is to be commended. The glass-half-full-or-empty argument may continue, with the market casting the final vote in the coming months and years. Going back to the HP positioning in the first paragraph of the release and excerpted here, the key word in it all is "easy", in my opinion. If a large enough segment of the market votes with their dollars for an easier, simpler approach to printed web content, HP may indeed have today planted the first flag in a new category, something that doesn't come along very often! It all started with a tweet Thursday evening, from the "HP_IPG" (that's the "real" Imaging and Printing Group's Twitter name), simply stating "Something is brewing around here...". Now the mystery is filling in, with more tweets from HP and Porter Novelli account holders, all with a little speculation from industry pundits. 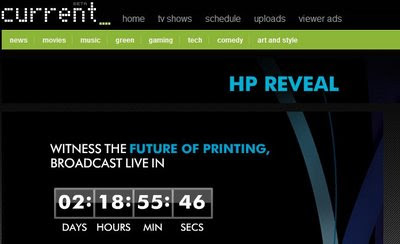 Included are directions to a web site (www.hp.current.com) with a count-down timer heading to a Monday morning "zero hour", and which for now simply promises to Reveal the Future of Printing. Stay tuned. And join the Tweetup at http://twtvite.com/hjixk0 for first-hand info. The twitter hashcode is #HPReveal. Word is out today, from ReadWriteWeb (see "Google Book Search Just Got Better") and others, that Google Book search, also covered here often (e.g. 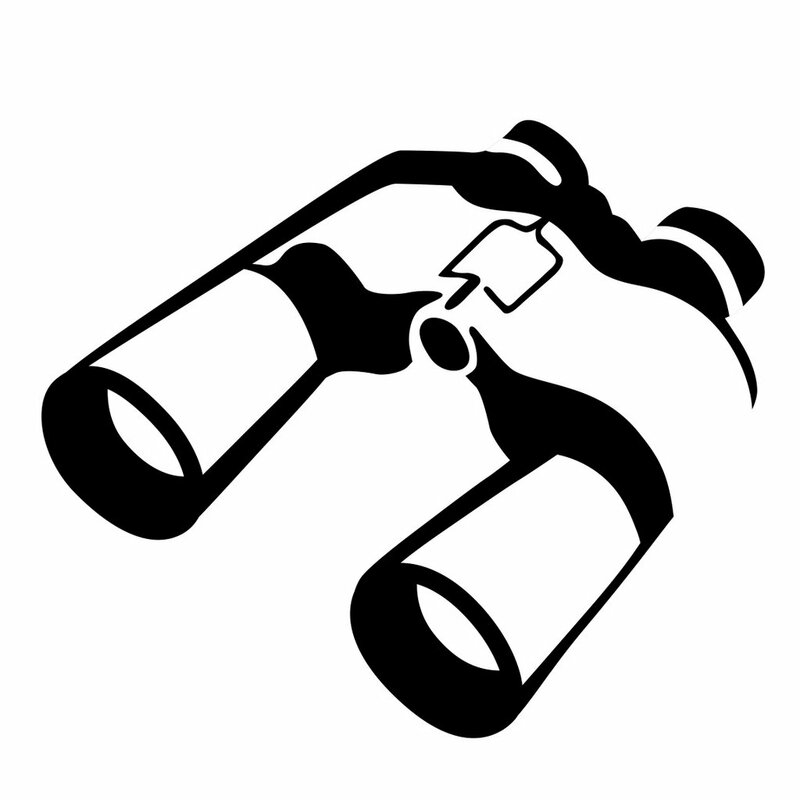 see "Observations: Google Book Search"), has expanded its features and capabilities. Of the seven "new and useful features, including the ability to easily embed a book into a blog post, better search within books, easier access to tables of content, and a way to turn pages, as well as an improved Book Overview page" as pointed out by Frederic Lardinois in the RWW post, I just had to try the "embed a book" feature. See my first try, below. As much as I was drawn to the idea of writing about Twitter and printing in this month’s column, I am postponing that for a month. Although, with the plethora of Twitter buzz in the first half of 2009, I recognize that by waiting, I risk looking like a member of the “late majority” segment when it comes to Twitter. The magazine segment has pulled me in once again though, and I offer several of my latest observations this month, which is a follow up to our coverage of PC Magazine’s transition to online-only status late last year and a little related nostalgia (Observer, 1/09 and 2/09) and the “magazine-like” publishing efforts I have covered with The Printed Blog (Observer, 4/09) and HP’s Tabbloid solution (Observer, 5/09). While the newspaper industry’s imperiled status has made headlines, magazines are not in a much better position. Ad dollars, relative to overall advertising volumes and media mix, are at a low ebb lately, and just the physical thickness (or actually lack thereof) of household staples like Newsweek and Business Week is enough to give a chill to long-time readers like me. Clearly the industry is in flux, and the future of the printed magazine seems very much up in the air. A publication called Mine is Time Inc.’s latest experiment with customized content. 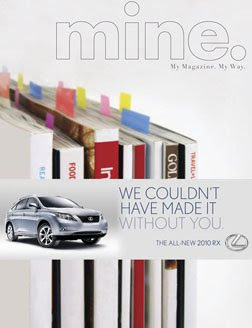 Based on a questionnaire you complete when applying for a free, five-issue subscription, you receive a personalized issue that includes articles from eight different (previously published) Time and American Express publications, including Food & Wine, Golf, In-Style, Money, Real Simple, Sports Illustrated, Time, and Travel + Leisure. A sample cover of Mine is shown in the image above. The short list of profiling questions is curious (e.g. “Which do you crave more, sushi or pizza?” and “Who would you like to have dinner with most, Leonardo da Vinci or Socrates?”), but after completing the simple registration a few weeks ago, I got my first copy in the mail. Mine is attractively printed and looks good enough to make a digital typesetter champion proud. I love the name and its dual meaning: “I, me, mine” and the reference (at least to me) that comes from “data mining” and personalization possibilities. Truthfully, though, as far as the publication itself, I still have not read it and probably will not. After all, when will I find the time, with all those tweets out there pouring in? 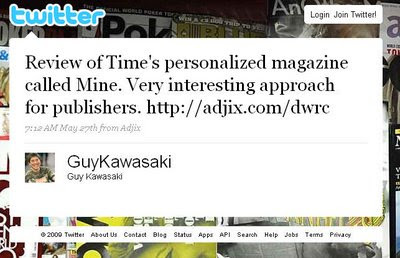 Speaking of tweets, I recently received a relevant one from author and business evangelist Guy Kawasaki. In its 140 characters, the tweet contains a link to a surprisingly positive review of Mine from Slate’s technology columnist Farhad Manjoo. 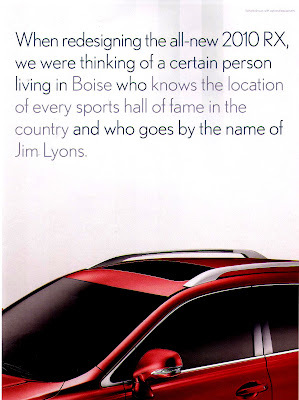 As I write this, I have just received the e-mail and Zinio pop-up reminding me that my June issue of PC Magazine is “in”. But frankly I will probably ignore it and neither print nor read it in its current form, as I have treated the last several issues. I am confident I have found or will find important or interesting news elsewhere, lately due to the great tweets from all the Ziff Davis editors that give me an immediate heads-ups on great online content. Zink printer for Apple iPhone - speculation? 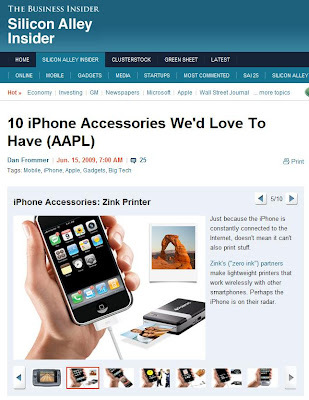 Dan Frommer at Silicon Alley has a piece today titled "10 iPhone Accessories We'd Love To Have (AAPL)" and I couldn't resist taking a quick look, thinking perhaps I'd find a printer. And...bingo! During last week's WorldWide Developers' Conference (WWDC), Apple announced its new iPhone 3GS, and along with it, capabilities for adding third-party hardware products to the iPhone platform. The Silicon Alley Insider piece has fun with a vision for ten future iPhone accessories, and among the more down-to-earth is a direct-connect Zink printer. 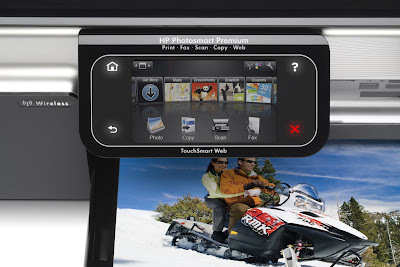 For regular readers of this blog, it comes as now surprise that Zink printers and iPhone printing would seem to make a natural convergence, so much so that one of the most common questions/complaints is that Zink-based products like the Polaroid PoGo and Dell Wasabi Zink-based printers DON'T work with the Apple iPhone. 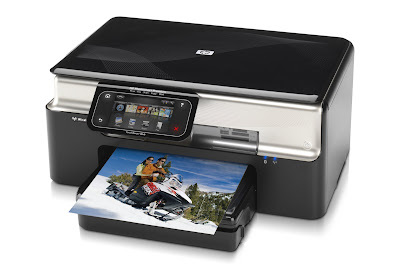 Of course, these are both wireless printers, so the direct-connect aspect of the "10 We'd Love to Have..." vision doesn't seem like the gating factor. However, of the various fanciful ideas in the article, it seems that the one for the printer accessory is among the most down-to-earth and honestly in-demand iPhone accessory ideas out there (along with the SD card reader, which I will take any time it's ready!). But maybe there's a meat-thermometer-blogger out there praising that suggestion and dissing the printer! A tweet came across this morning from @DOCUMENTmedia, with an alarming if not altogether surprising headline, "Imaging Industry at Lowest Margins Ever". The link is to an article summarizing a new report, from none other than the Woodford Group (see my blogroll), and it summarizes the results contained in the company's latest compilation, detailing the quarterly revenues and profits for the imaging industry. The first and most obvious of these [negative factors] is the tightening-the-belt effect that most companies experience in the face of a serious economic downturn. Both at channel and end user levels, restriction on purchasing is strictly enforced, as is tighter inventory control. Secondly, many imaging industry firms are opportunistically restructuring, which affects their bottom line. The final and perhaps most significant influence on the imaging industry is the shift in usage patterns, specifically a reduction in overall print volumes. This is difficult to quantify because it is overshadowed by the other gating influences. Although all three radically affect revenue and margin, the third influence will likely have the most lasting impact on the industry as a whole. While Woodford has a five-year history of the quarterly reports, I imagine they'd agree that the "lowest ever" in the headline would qualify as a bit of an over-statement, as "ever" is a long long time! The recently announced Microsoft Bing search engine, announced just the week before last, is making some good headway, according to comScore numbers as reported by TechCrunch's Robin Wauters (see "comScore Study: Bing Is Off To A Very Good Start"). A Statcounter study reported last week that Bing searches (when combined with other existing Microsoft Search sites) had even surpassed Yahoo! for at least a day, and even at this humble blog, Microsoft searches have recently approached double-digits, though still far behind Yahoo! and king-of-the-hill Google. But boy is it good to have some real competition in search going, even if just for a short while. A New York Times piece today (see "Apps Are Booming as Companies Seek a Place on Your Phone", by Jenna Wortham, points to the rapidly growing iPhone application developer community. With Apple's (NASDAQ AAPL) worldwide developer conference kicking off today in San Francisco, great interest surronds this rapidly expanding area. And printing capabilities are riding the wave. 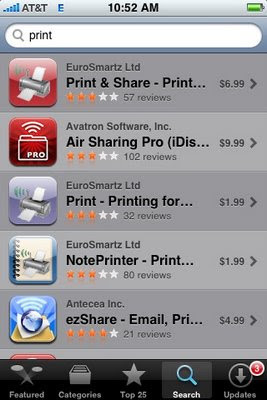 Pictured are the first two screens of many printing or printing-related applications (plus the inevitable outliers) that I found this morning simply searching on "print" in the Apps store. Observations: Kindle meets iPhone -- what about printing? Xerox has a video on Youtube.com, "Information Overload Syndrome", that is attracting some marketing-industry attention. The Wall Street Journal's blog, Digits, has a piece by Bill Bulkeley, "Can a Made-Up Disease Help Xerox Sell Services? 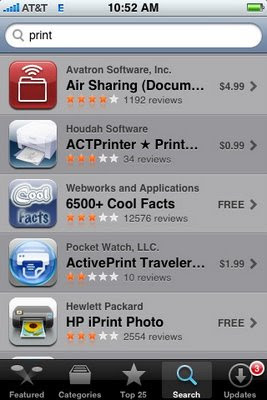 ", that explores Xerox's efforts at "going viral" with this excellent (and yes, over-the-top) mock-news-style exploration of "IOS". At under 8,000 views on YouTube after several weeks, it's not exactly setting the world on fire, but certainly should be viewed as an overall success and innovative use of new media resources, using a "very modest amount" of money, as Bulkeley quotes Young and Rubicam's Christa Carone. And like many of its ilk, the video only indirectly gets at a true "call to action", which we infer is engaging Xerox and their managed print services capabilities. And by the way, I was informed of the WSJ piece (and the video) by a "tweet" from @XeroxCorp! Thanks to @EricSchonfeld at techcrunch.com, I gave Google Squared a quick try. See Eric's piece ("Google Squared Goes Live, Puts Web Search into a Spreadsheet") for the background on this latest Google innovation. Doing an industry-specific trial run I wanted to see what it could put together on Managed Print Services. (See screen shot.) Being a "Google Labs" project, we tolerate it being somewhat crude and unpredictable (like, what's the frequency, Kenneth? ), but on the other hand, one can see the future from here! HP (NYSE HPQ) has a pair of environmentally-themed press releases today, including one headlined HP Extends Environmental Leadership with New Technology to Save Customers Money. The dollars-and-cents linkage to "green" initiatives is not new, but continues to be a growing theme, as some have questioned the future of "esoteric" environmental objectives for companies struggling through tough times. But green-friendly policies can go hand-in-hand with frugality, and HP is wisely taking this tack in today's announcement, with a description of many of the quantifiable improvements HP is helping its customers make with it Eco Solutions Program. (1) Estimated energy and paper savings based on analysis of select HP Managed Print Services customers’ imaging and printing operations using data gathered on their devices and paper consumption and comparing to post-MPS actuals and/or projections. (11) The tonnes of CO2 avoided is based on power plant emissions that otherwise would occur to generate the electricity saved; cars removed is based on annual emissions from cars burning gasoline. (12) Calculation assumes that each half-liter, one-use plastic water bottle weighs 11 grams: http://dogmatic.com/MNR/aquafina/ecofinabottle/documents/EcoFinaFactSheet.pdf. (13) According to internal analysis of available external data, conducted by HP’s Imaging and Printing Group’s Research Alliance. I will be posting more on some of the "qualitative" points of the program in the coming days. Server sales way down -- good news for printers? I am just reading the summary of Gartner's report by Rex Crum at Marketwatch that first-quarter 2009 server sales, shipments drop 24%. HP (NYSE HPQ), Dell (NASDAQ DELL), and IBM (NYSE IBM), and Sun (NASDAQ JAVA) all showing server revenue declines ranging from 20% to 26%. With the printer business sagging as well, and industry leader HP recently reporting overall printing and imaging declines at 23% (see "HP Q2 2009 Printer Metrics"), it would seem that tracking the server business might not be all bad in terms of printers' future prospects. While much has been made of potential warning signs of the impending demise of hard copy, realized quarterly revenue dips "only" equivalent to servers might be, to some at least, perversely comforting.